I've always admired Murray House, the colonnaded nineteenth-century building looking out into the bay in Stanley and thought that the restaurants with their cute old-fashioned ceiling fans would be a good bet for a lazy weekend lunch. With the sun shining far too much for a spot of sangria not to be an option, a couple of us decided to try Mijas, a Spanish restaurant, with perhaps the prime spot in Murray House. It occupies the sea-facing corner and has a beautiful wide, covered balcony with both normal tables and those low-rise sofa tables designed specifically so you will never get up again - perfect for our lazy lunch! With such a location, Mijas has everything going for it and I was therefore totally gutted about how boring the food was. It wasn't bad as such, it was just seriously bland - to the point where I am nearly falling asleep thinking about it. Realising that we were loosing the battle to ever stand up again once sat down in the sofa table area, we decided that tapas and sangria would be the way forward. And, in all fairness, the sangria was quite good but then, seriously, how far wrong can you go with sangria? The menu looked good, covering all the classic dishes that I could remember and a couple more with a bit of a "creative twist". All looking good - great view, comfy sofas, glorious sunshine and a glass of sangria in my hand. What a tragedy then that the meal fell flat when the uber-dull tapas arrived. The crisp-fried calamari with pepper and wasabi hollandaise sounded fantastic but the thick hollandaise dipping sauce was pretty tasteless. Equally the patatas bravas lacked any semblance of spiciness whatsoever which is somewhat ironic when the name translates into English as "fierce potatoes"! Things didn't look up when the meatballs in tomato sauce arrived - indeed, they'd used the same sauce as for the patatas bravas and so it was ok but not very exciting. The classic boquerones tapas dish had hit something of a budget cut and consisted of both white anchovies and the salty brown tinned ones. None of the other dishes - the grilled chorizo with arugula and asparagus and the tomato salad - were inspiring either. There was nothing particularly wrong with them - I mean, don't get me wrong, we found it in ourselves to eat it all - but they just weren't right. Stanley is not a complicated place: you have a lazy weekend lunch at one of the waterside restaurants and then you thoroughly exhaust yourself bargaining for tat at the market. The taxi ride home is always a bit of a blur because you've hit such a sugar low from all that intensive shopping. Luckily, however, my latest trip to Stanley lead to the discovery of a bakery which solves this problem. Saffron Bakery, a little gem of a place in Stanley Plaza, sells everything you could need to recover from the market experience - whether your fix is a cute little cupcake, a gingerbread man or a more traditional slice of loaf-cake. The bakery / cafe has a rather over-whelming selection of traditional cakes, muffins, gingerbread men and cupcakes, with some of them piled up temptingly on a stand in the window. The items are not fancy, delicate little numbers like you might get in the cake shops in Central, rather, they are hearty, traditional, home-baked cakes. The place plays on your, possibly rose-tinted, view of an old-fashioned cakeshop and indeed, goes further by having a sweet corner filled with everything you ever overindulged in as a child - remember Nerds anyone? Or the sweets you can wear as a bracelet? 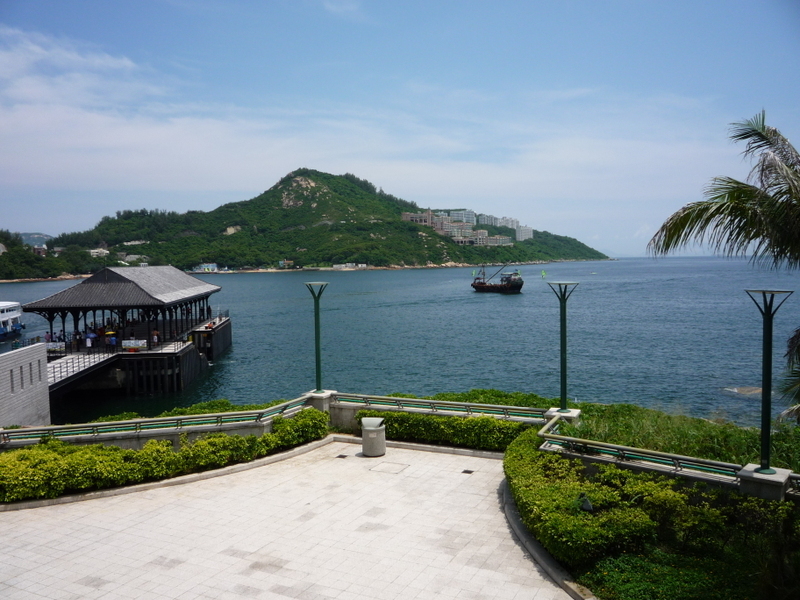 Should blue skies ever return to Hong Kong, you should immediately stop what you're doing and book a table at Cococabana, a stunning beach-side restaurant in Deep Water Bay. The view itself is well worth the trip to this al fresco restaurant and the excellent food an added bonus. 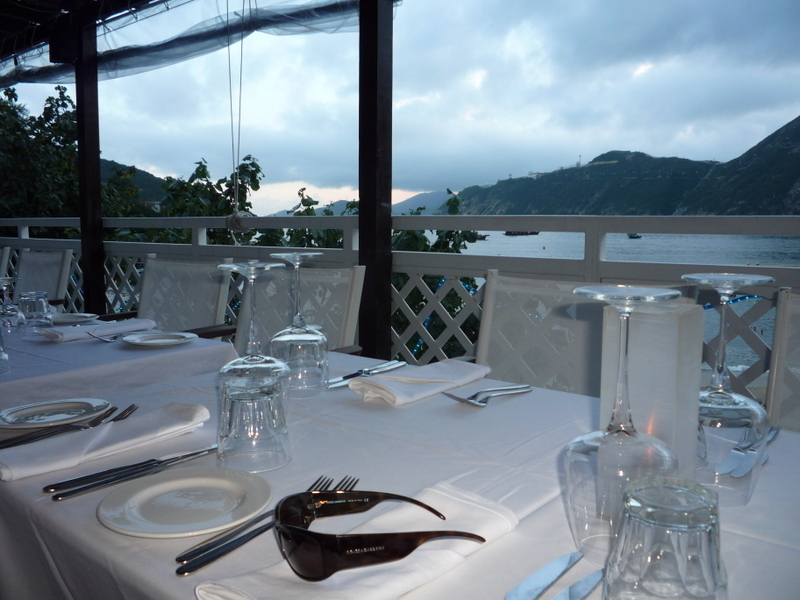 The restaurant is right on the beach and has great views across the bay to the hillside along which the Ocean Park cable-car runs. It's therefore a great place to watch the sun-setting, particularly as the subtle cable-car lights don't go off until quite late, highlighting the hillside against the black sky. Sounds idyllic right? Well, it is although, like most restaurants in Hong Kong, there is something slightly odd about its location. Usually it's the fact that it's a swish restaurant situated in a shopping mall or high up in a hum-drum office block but in this case, it's that it is situated on top of the public toilet block! Luckily, however, this fact is quickly forgotten as soon as you enter the restaurant! In the evenings they offer a set three course menu for HK$390 which allows you anything from the extensive menu. I chose pan-fried fresh foie gras on a turnip confit with a balsamico sauce as my starter and was not disappointed. The slightly salty turnip beautifully complemented the stunning foie gras. Given we were by the sea I felt obligated to have some form of seafood as my main course and so I opted for the piri piri king prawns with garlic and chili on cous cous with tomato and shallot salad. The prawns were perfectly cooked as was the cous cous - sounds silly to judge a restaurant on this because cous cous is so simple to cook but lots of restaurants cut corners turning it into either a single massive lump of cous cous or, even worse, a soggy mess. I love coffee, I love chocolate and I love mascarpone which means that Tiramisu was pretty much designed with me in mind. Wonderfully they had tiramisu on the menu. However, I was totally gutted when I tasted it. It was an overly sweet cream desert with virtually no coffee flavour. It tasted good but shouldn't have been advertised as tiramisu. Some of my friends had the apple tart with vanilla ice cream which they enjoyed but they found the bits of apple skin in the desert a little off-putting. Despite the mis-labeling of the tiramisu, I still think this is one of the nicest restaurants I've been to in Hong Kong. The restaurant is perfectly nice as twee Stanley goes but 'divine' is seriously stretching it. My friend E's crostini with parma ham and mozzarella was full of flavour, and my friend L's lemon and honeycomb cheesecake went down well. A nice restaurant in Stanley, yes but 'divine'? No.